PRICE HK$ 200 for 3 carryall bags. Higher end bags go for up to HK$ 720. PRODUCT RATING Very good. Functions very well as a shopping, gym or swim bag. Nicely designed, one-of-a-kind bags. Please note we have not tried out the higher end bags. GREEN RATING Deep Green. Up-cycling durable but useless advertising banners into useful bags. These banners likely would otherwise have gone into the landfill. Locally produced. Have you ever wondered what happens to those advertising banners that are literally everywhere in Hong Kong? As you can probably guess, after a very short “useful” life, they usually end up in the landfill. Banner Bags takes these banners and creates unique, one-of-a-kind bags out of them. This is a perfect example of up-cycling. The bags are made right here in Hong Kong, meaning that there are also no carbon emissions from transportation. For these reasons we rate Banner Bags Deep Green. The three questions we look at when buying a bag are: does it function well? is it durable and well made? does it look gooood? Lets start with the last one first, cause we all know, with so many choices out there, we won’t buy a bag unless it makes us look fabulous. The bags are nicely shaped and have visually appealing graphic designs. (You don’t need to worry, the bags won’t have photos from the advertising banners of District Council members) The design team takes meticulous care fitting patterns and colors together in an aesthetically appealing way. According to the owner, manufacturing had originally been set up on the mainland, however workers there didn’t have the design sense to create bags that looked good. So manufacturing was brought back to Hong Kong. With most mass produced items, it’s difficult to own something unique. (Everyone in Hong Kong seems to own the same LV bags, making me wonder if we have an evolutionary predisposition towards the letters L and V, in the same way that monkeys have a preference for yellow tubular objects). 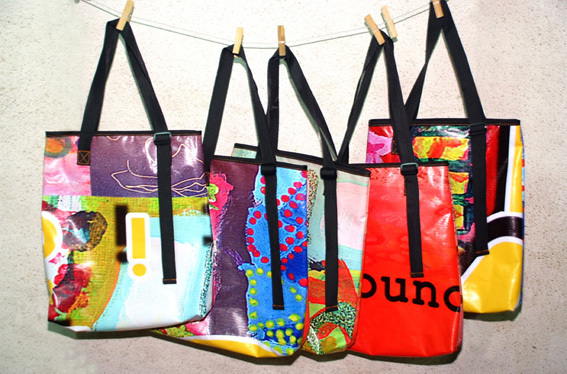 With Banner Bags, each bag is different and they come in wide array of designs. Whether you’re a hipster, stay-at-home mom or busy executive, you’ll be able to find a banner bag that suits you. The stiffness of the banner material provides structure to the bag, making Banner Bags great for grocery shopping. The stiffness of the bag ensures that the heavy items, like cans or glass jars, stay at the bottom. This means that delicate items, like bread, eggs or veggie, won’t get crushed. The drawback is that you can’t just stuff one in your pocket or handbag. The bags are also great for taking to the pool, beach or gym. The material is essentially waterproof, so you don’t need to bring along a separate plastic bag to put wet clothes in. The smooth, waterproof skin of the bags makes for easy cleaning – just give it a wipe with a damp cloth. This feature makes banner bags perfect as a gym bag. They are much easier to clean than traditional nylon gym bags. The material banners are made of is quite durable. Banners are made to withstand the sun, rain and wind. The assembly work seems to be of quite decent quality. However we haven’t owned them for very long, so its hard to say how durable they will be in the long run. These bags help to reduce a serious environmental problem while at the same time being functional and aesthetically appealing. What else would you look for in a great Christmas gift?